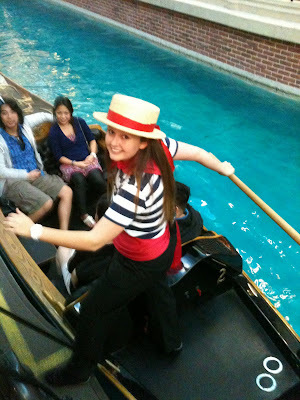 We went for a gondola ride and had a singing Italian driver who is also an elementary school music teacher by day! She sang "O solo mio" for us and she has a beautiful, clear voice. What fun! 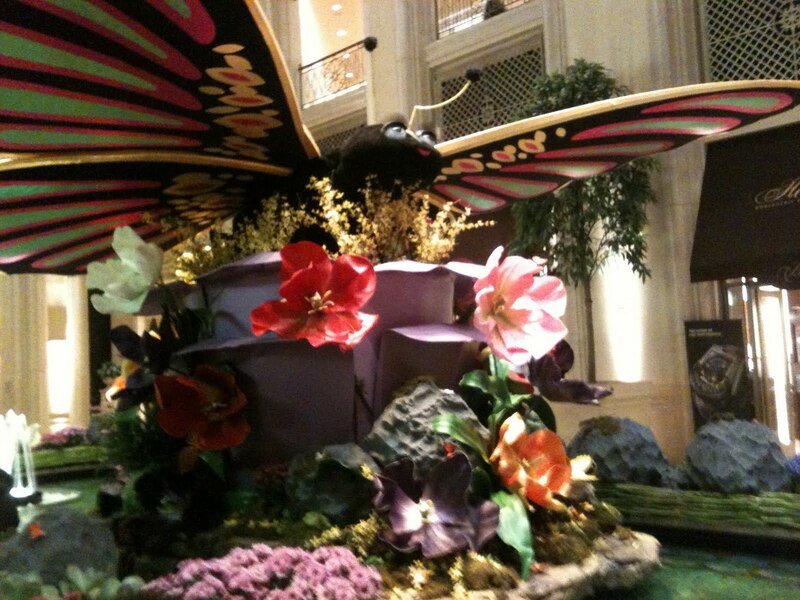 This butterfly is made of flowers! It was in the middle of the Palazzo. Cool place. And, of course, we saw Nunsense and had pictures with all the nuns. We even got them to sign the 'holy card' Dad won at the beginning of the show during the 'quiz' section! Then we had steak and lobster at Benihanas and went to see "Jersey Boys" after dinner. That's the story of Frankie Valli and the 4 Seasons. It was wonderful! What a fun trip - and it was really only 1 1/2 days! I flew in Friday afternoon and left early Sunday. Well, Steve knows how to plan a good time! 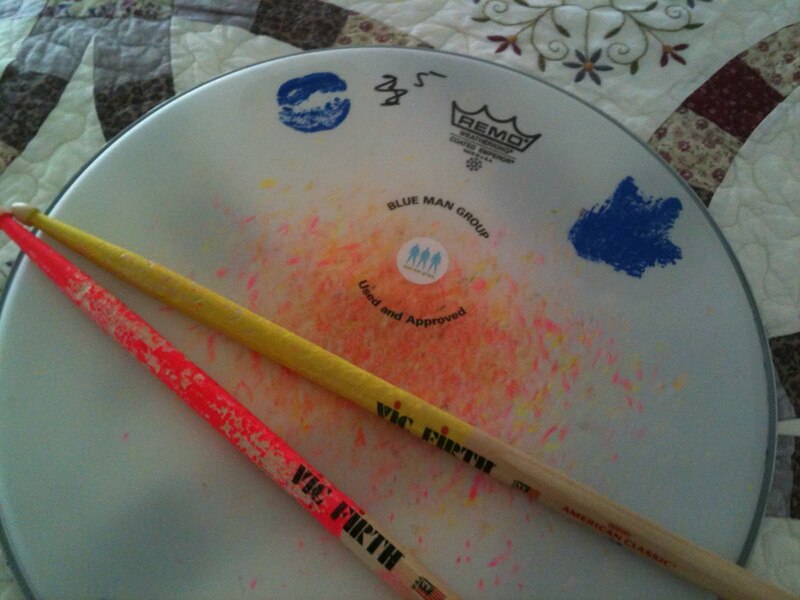 Here is my specially autographed 'used' drum head from Blue Man Group. 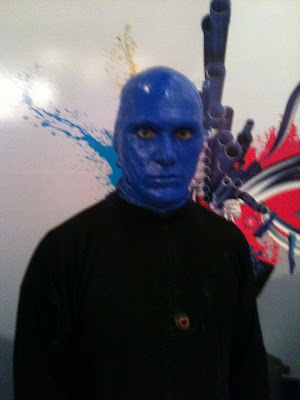 I walked up to one of the performers after the show and asked for his autograph (the salesman in the Blue Man store advised me to do that). I told him I didn't have a pen... No problem! He just kissed the drum head with his blue lips and left quite the impression! Then someone walked up to me with a couple of clear, round sticky thingies and said to stick them over the 'autograph' so it wouldn't smear. Well, then I found another performer and asked for his autograph figuring I'd get 2 lip prints - and he took the drum head and smacked it on his forehead! Voila! The forehead print! Could you have more fun than that? The drum sticks were 'previously used' also. How cool is this? 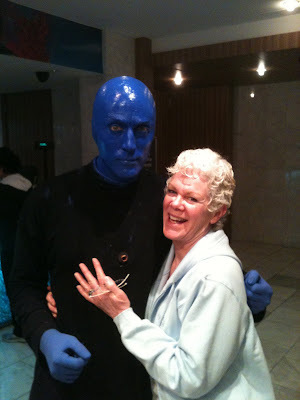 Our first night in Vegas we went to see the Blue Man Group. What fun!!! These guys don't ever say a word, but they are funny!!! And they are GREAT percussionists! Wow! 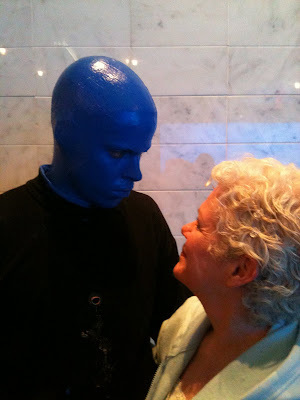 And at the 'meet and greet' after the show, they still don't say a word, but they just stare at you! It's a little creepy, but LOTS of fun! This one found out that I was a teacher and he shook my hand. That was cool. Anybody wanna go see the show with me? Next time I'm going to buy tickets for the first few rows where they hand out ear plugs and rain gear!!! Maybe I'll get lucky and they'll invite me on stage! Woo-hoo! Cutest Luggage on the Planet! Well, while I was in Las Vegas, Steve and I went into a luggage store so he could look for a new piece of luggage... I saw the cutest stuff ever made on the back wall, and it wasn't even that expensive! 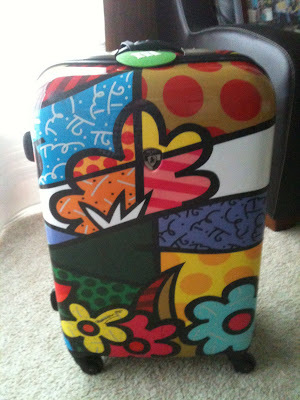 (for luggage, that is...) Anyway, it made the trip home only a little scarred by it's maiden voyage, so it is safely stowed away in the closet waiting for my next excursion! 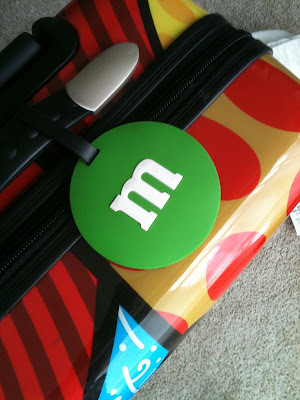 Oh, and I had to make a trip to the M&M store for a cute bag tag to go on it! We met at BYU and were married 30 years ago! 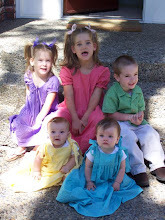 We have 4 great kids, 4 terrific in-law kids and almost 8 super intelligent and gorgeous grandkids. We have lived all over the place, and have visited even more than that! Once I figure out how to manage a blog you'll see lots of posts of what we've done and will do in the future!